Me and my family is a loyal user of Philips Lighting when it comes to lighting. 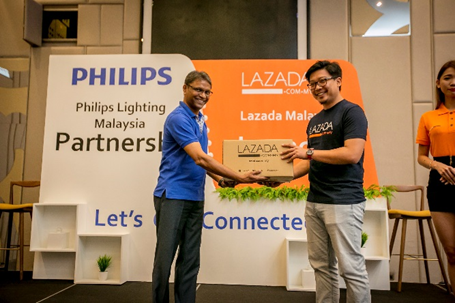 We are happy that we could now purchase Philips Lighting online from Lazada Malaysia. Philips Lighting (Euronext Amsterdam ticker: LIGHT), a global leader in lighting, has announced the official launch of its specialty e-store on Lazada Malaysia, the country’s number one online shopping mall with over with over 25 million monthly desktop visits. This partnership signifies a major step forward for Philips Lighting, as well as the lighting industry in Malaysia as it opens up a whole new channel to better serve the growing needs of savvy online shoppers by offering a comprehensive range of indoor and outdoor lighting solutions. (L - R) Mr. Alston Foo, Head of Consumer Sales Philips Lighting Malaysia & Singapore, Mr. Fuji Sartono, Head of Marketing Philips Lighting Malaysia, Mr. Alok Ghose, Managing Director for Singapore & Malaysia, Mr. Kevin Lee Fong Siang, COO of Lazada Malaysia, Mr. Simon Paterson, Lazada Regional Category Director, Home & Lifestyle pose with Philips Lighting products available on its e-specialty store. Managing Director for Philips Lighting Malaysia and Singapore Mr Alok Ghose said the tie-up is in line with the company’s market position as the leader in connected lighting and fits aptly with its theme for this year, Let’s Get Connected. “Philips Lighting aims to take the ultimate step of introducing a host of smart and sustainable LED lighting products, turning them to be part of the Internet of Things (IoT) eco-system to create an engaging user experience. This year’s theme is a culmination of a 3-year consumer experience journey which began with Let’s Go Green in 2015 and followed by Light Beyond Illumination in 2016,” Ghose said. 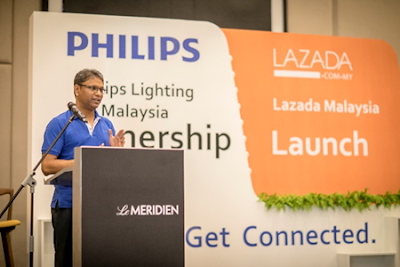 He added that by partnering Lazada Malaysia, it was also a great opportunity for Philips Lighting to tap into the growing e-Commerce market segment and unlocking new business revenue, while at the same time, delivering richer lighting experience to the Malaysian consumers via the platform. According to leading online statistics agency Statista, Malaysia’s e-commerce revenue is projected to grow exponentially to over USD2 billion (RM8.9 billion) by 2020, from USD991 million (RM4.4 billion) currently. “At Philips Lighting, we understand the sophisticated interaction between light, its effect on people and their surrounding environment. This knowledge results in lighting innovations that exceeds our customers’ expectations, providing them with outstanding lighting solutions and experiences,” said Ghose. “E-Commerce is fast gaining traction, and becoming a big contributor to the omniretail trend. As a market leader in connected lighting, we aim to stay ahead in the game by being the first lighting company to tap into this growing segment. Through the Philips Lighting – Lazada partnership, consumers will be able to access and purchase a range of Philips Lighting while being assured of a reliable buying experience and prompt delivery to their doorstep from Lazada Malaysia,“ Ghose added. 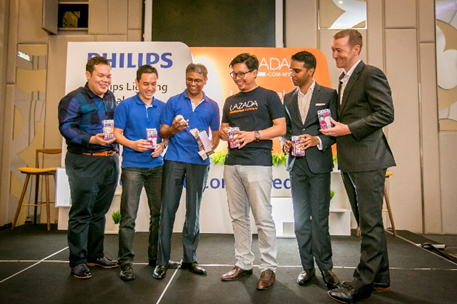 Mr. Alok Ghose Managing Director, Philips Lighting (Left) and Mr. Kevin Lee Fong Siang, COO of Lazada Malaysia (Right) officiate the launch of the first ever Philips Lighting specialty e-store on Lazada. For over 120 years, Philips Lighting has been at the forefront of innovation, delivering truly meaningful lighting by combining people’s needs with its expertise in lighting technology, human behavior, and the biological effects of light. In bringing about brighter lives in a better world, Philips Lighting believes that everyone should experience and interact with the best light possible at every moment of the day or night to make them more comfortable and productive. At Philips Lighting, light is used to make people feel happier and safer – light that entertains, inspires, and informs, makes cities more livable, and satisfies people’s daily needs. Mr. Alok Ghose, Managing Director of Philips Lighting welcomes the crowd in his opening speech at the Launch of Philips Lighting’s e-specialty store on Lazada Malaysia. Besides launching Philips Lighting specialty e-store on Lazada Malaysia, the company also hosted a Partnership Day event in Kuala Lumpur for over 140 local distributors throughout the country. In conjunction with the specialty e-store launch, Philips Lighting is also introducing a series of exciting and attractive promotions for online shoppers on Lazada Malaysia. For the grand launch on 7th February 2017, a store wide discount of up to 66% can be enjoyed for every online purchase of Philips Lighting products made via Lazada Malaysia, applicable while stocks last. Also, the first 100 orders will receive two movie tickets when total purchase exceeds RM100 - terms and conditions apply. Check out www.lazada.com.my/philips-lighting-official-store to find more! Varieties of light bulb offer by Philips. And is durable and come with different design.